A federal judge has ordered that prolific patent troll Uniloc cannot hide its shell games from the public. After EFF filed a motion to intervene seeking access to sealed court records, Judge William H. Alsup of the Northern District of California has ordered [PDF] that the relevant documents should be made public. Judge Alsup stayed his order for two weeks, however, to give Uniloc an opportunity to appeal to the Federal Circuit. We are pleased by the court’s ruling and will defend it if appealed. The sealed documents have an importance far beyond this case. As Judge Alsup suggested in court, Uniloc appeared to be using complex machinations to hide its patents or its assets, possibly to avoid being hit with sanctions. The public has a right to know who owns patents, especially patents like the ones Uniloc claims to own, since the company has claimed its patents entitle it to payments from a vast array of technology companies. In a heavily redacted motion to dismiss, Apple appears to argue that Uniloc entities and Fortress Investment Group LLC divided rights in the asserted patents in a way that means the Uniloc entities no longer had a legal right to sue for infringement. We say “appears” because the public cannot see most of the briefing and evidence. 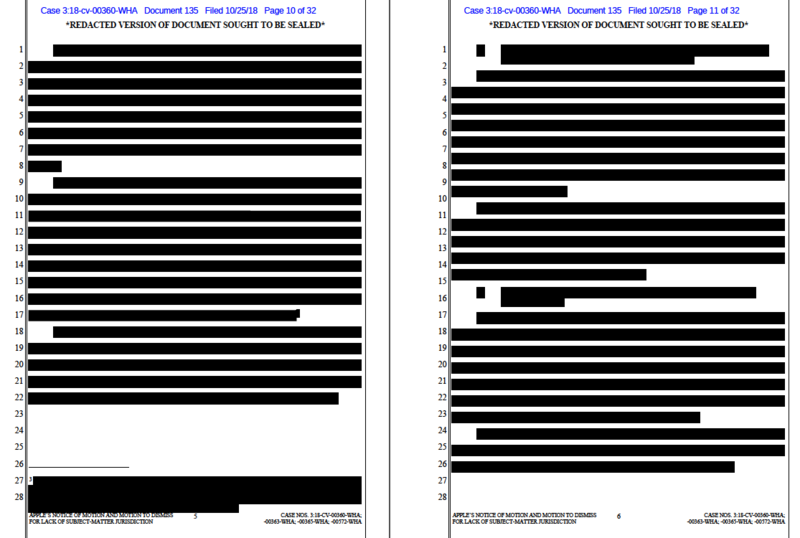 Because the redactions (requested by Uniloc) make it impossible to understand the dispute, we moved to intervene to seek public access. Plaintiffs’ generalized assertion of potential competitive harm fails to outweigh the public’s right to learn of the ownership of the patents-in-suit — which grant said owner the right to publicly exclude others. This is especially true given that the law has developed regarding standing issues, which turns on machinations such as those at issue in the instant actions. Judge Alsup has also issued a ruling on Apple’s motion to dismiss. We presume from context that this ruling denies Apple’s motion (but we can’t be certain since we haven’t seen it). If Uniloc does not appeal the related unsealing order, or if it appeals and loses, the public will get access to the full opinion. EFF will, of course, oppose any appeal of Judge Alsup’s unsealing order. The sealed information is central to an important dispute about who can bring a patent suit. Without access to the sealed evidence, the public will not be able to understand the parties’ arguments or the district court’s ruling. Ultimately, Uniloc should not be able to hide which entity owns (or claims to own) a patent. A patent owner’s desire to confound the public cannot outweigh the public’s First Amendment right of access to courts.